Talk about being ocean smart. A seal swimming off the coast of Vancouver Island escaped a pod of killer whales by hitching a ride on someone's boat on Monday. Peter Hamilton, founder of the Lifeforce ecology organization, said the seal had about 10 orcas on its tail. Hamilton said the whales eventually gave up and left, and the seal "cautiously" slipped back into the water and swam way. The ecologist told The Huffington Post Canada it's an incident that "happens very rarely." Last summer, another seal pulled the same stunt to avoid being eaten by killer whales in B.C. 's Desolation Sound. 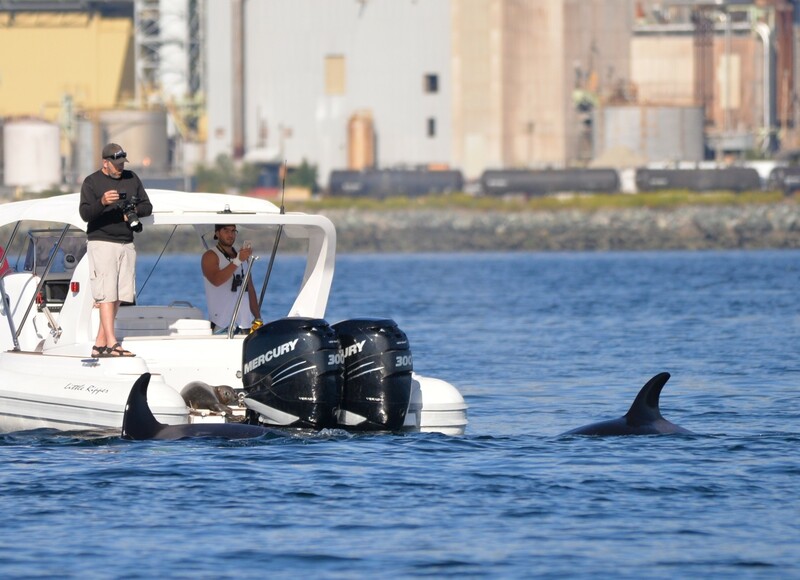 To help protect the animals in B.C., people are advised to stay stay at least 100 metres away from marine animals or birds. If boaters find themselves stuck too close to an animal, they're advised to stay still and let the animals pass. Seal Fights Octopus Off In Victoria, B.C.